Ancestors of the fallen Australian and New Zealand soldiers gathered in Çanakkale during the Dawn Service last year. For those hailing from Australia and New Zealand, Anzac Day is considered to be the birth of patriotism and is a commemoration of the thousands of young Aussies and Kiwis who gave their lives in 1915 by fighting for the Allied Forces against the Ottoman Empire in Turkey's Gallipoli peninsula during World War I. Since then, April 25 has become Anzac Day, a national day of remembrance commemorated in Australia and New Zealand for the lives lost in what is also referred to as the Dardanelles Campaign. Commemorating and celebrating the commitment of ANZAC troops, an abbreviation for the Australian and New Zealand Army Corps, has become for many from those parts a rite of passage. Thus every year, similar to the troops themselves, thousands travel halfway across the world to commemorate and remember the lives lost in the Battle of Gallipoli. The Turks also celebrate the success of Mustafa Kemal Atatürk, a colonel lieutenant at the time who led his troops to victory. This is commemorated in Turkey on March 18 and known as Çanakkale Naval Victory Day. While the victory of this battle holds significance for the Turks, ANZAC Day is the commemoration of the tragic loss of hundreds of thousands of lives, of soldiers battling on the other side of the world, far from their own hometowns. It is this factor that compels many from Australian and New Zealand to take part in an epic journey to Turkey and its Gallipoli peninsula to experience the sense of nationalism those forces must have had battling so far from home. The Gallipoli peninsula is located on the northern shore of the Dardanelles, which was considered a foothold to conquering Asia Minor from Europe. 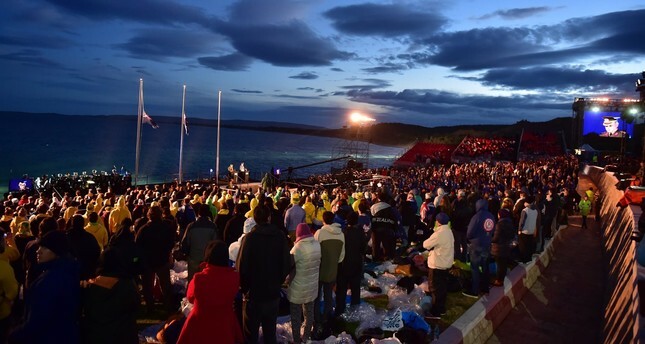 Therefore on April 25 thousands of Australians and New Zealanders head to Gallipoli to tour the ruins and take part in the special Dawn Service at Lone Pine, many times Australian government officials will also lead the event. There is also a service held for New Zealanders at Chunuk Bair. It is virtually impossible to attend both however due to the timing and distance. Also, keep in mind that touring the memorial sites and getting back to your transportation involves an approximate 8 kilometer hike in total and sometimes involves climbs. While this can all be daunting for independent travelers interested in checking out the battlefield sites and the Anzac Dawn Service ceremony, I am here to tell you that it is possible to take part in all of the fanfare on your own and from Turkey. Bar none, your best bet in joining in Anzac Day celebrations in a similar fashion to the thousands of Australians and New Zealanders that will be visiting, is to take part in a professional organized tour on the day, and if possible, spend the evening prior and following at a hotel on the peninsula. As for tours, luckily there is an expert tour guide and artist by the name of Craig Roach, aka Roachie the Gallipoli Artist, who just so happens to be an Australian expat living in Turkey. Unfortunately, Craig's tours are already filled for this year, as he serves as the Resident Historian for Mat McLachlan Battlefield Tours, which is one of the best battlefield history tour companies in the world. In the 2015 centennial, they brought 2,000 people alone from Australia to Gallipoli. However, Craig has kindly shared his advice on where to stay, how to take a tour and how to do it on your own. For tours, Crowded House will be offering both a Dawn Service tour on the day and starting from Eceabat as well as a three-day tour, which will start off and end in Istanbul. TJs Hotel and Tours also offer a Dawn Service tour as well as accommodation and are based in Eceabat. The other option is of course doing it entirely on your own, which is possible, however more challenging. Firstly, arriving by private car is not really advised. Not only is trying to park chaotic, but the only possibility is near the Mimoza Otopark, which is quite a distance to the commemorative sites. In addition, there are a number of road closures that take place on the day to accommodate the throngs of tours, which can make navigating on your own that much difficult. What to keep in mind is to enter the sites and attend the services, you must have an attendance pass, which is issued by the Australian Department of Veteran Affairs. Don't be daunted however, as they are issued to everyone, Turks and foreigners alike, and the application is filled out online through their website. It is also possible to register at a tent setup in the Mimoza area when you arrive. Yet, understandably the process is more efficient if you have pre-registered and printed out your pass. As for hotels, Craig suggests Crowded House, TJs or Ejder Hotel in neighboring Eceabat and as for those close to the Çanakkale port, accessible by regular ferry services, there is the Anzac Hotel, Akol and Büyük Truva. Craig will also have an exhibition of his work in which he paints the battle sites, which will take place from April 21-26 at the Büyük Truva Hotel in Çanakkale. I asked Craig if he had any advice for those wanting to take part in the Anzac Day celebrations in Gallipoli, to which he replied, "When people ask me what they should pack for the Dawn Service or Anzac time, I always tell them the two most important things to pack is 'A whole lot of patience and a big sense of humor.'"